I am always super attracted to black cars with black interiors. Sleek and elegant truly describe the black vehicles with black interiors. The trick to black interiors is not just upkeep but a few hidden secrets. The black car interior just seems to be an auto-attraction for dust and debris. Drops of water, spills of coffee, strands of hair all show up brilliantly against the black interior of a vehicle. After cleaning the interior of my black suv for about the 100th time I have decided its time to share my tips for keeping black car interiors clean. Lavishly live car interior cleaning out loud and join me in this adventure of up keeping car interiors. With three kids, travel ice hockey and being a travel writer, we are constantly in my vehicle getting from place to place. Often food, and toys come along and all leave their own mess. We have placed car seat covers down, but they usually are not the best thing, as when one part gets wet, or dirty the whole blanket has to come off. I don’t like how the car blankets make a vehicle look, they truly take away from the look of the vehicle. Honestly, keeping a black car interior clean is really not much different from keeping any other interior clean, but because black shows a little more brilliantly it is tagged as harder to keep clean. Seat covers work well if you don’t care about the aesthetics. Here are a few that I love. Because most Seat covers are wash, rinse and reuse they make a lot of sense for anyone spending mass amounts of time in their vehicle, or traveling with pets. Most are easily vacuumed or lint rolled as well, it just will truly be at the discretion of what the mess was. If your vehicle is inundated with pet hair, grab a Seat covers and clear up as much as you can before you vacuum. Now you are ready to vacuum the vehicle. Trying to remove ink on upholstery is typically difficult. But, in many cases, hairspray will do the trick. Try Club Soda for those little ‘fresh’ spots that seem a tad stubborn. Club Soda may not be so effective for stains that are set in. I get so upset when dust sets onto my dashboard, it just seems to concentrate and collect like a nesting zone. While I have not found anything that won’t allow the dust to collect, I do use a duster sheet to consistently wipe down the dash. My OCD just won’t allow for this mess to go on. Did you know that ordinary window cleaner works well to remove things like coffee stains from your vehicle’s carpet? Blot it, getting as much liquid as you can. When the stain will not come off, spray with glass cleaner, and let set for about 5 minutes. Now try blotting again and the stain should disappear. I will not and would not trade in my black car interior. What I do believe is that a little elbow grease goes a long way as does a weekly cleaning. Lavishly live auto care out loud and keep that black interior looking sharp with my tips for keeping black car interiors clean. Affiliate links contained within. Looking for more car tips and tricks? I picked up a cheap £5 cover from Groupon about 3 years ago and it’s still going strong. Does a good job of protecting the fabric from wet/muddy paws and is easy to fold up when not needed. This is some really good information about auto detailing. It is good to know that it would be smart to deep clean your upholstery. That does seem like a good thing to know if you want to improve the look of your car. I get so upset when dust sets onto my dashboard…I will try your Tips…Thanks! Cindy Huggins recently posted..How Can The Best Microfiber Mop Help You Clean? Car vacuum is a great addition to your cleaning regimen because it has one singular purpose – clean your car thoroughly, in the shortest time possible, and with minimum input on your part. No car-cleaning tool can perform that task better than a car vacuum cleaner. Secondly, a car vacuum cleaner is well adapted to clean a car, you can use it to take care of virtually all form of usual dirt that collects in cars, even in the hard to reach areas. Such that the interior of your car evokes that brand new, exquisite, pristine feel many years after purchase simply because you used the right tool for negligible amount of time to maintain your car interior. Great round up of tips. I’ve been feeling the itch to do some car cleaning. So these are perfect! I just got a new car, and its interior is black. So, I liked that club soda can be a good way for me to remove stains from the car. It might be smart for me to have a detailing professional help me keep it clean and looking nice. Thank you for your post. These are great tips! Many use the term waxing and polishing like they are the same things, but it’s good to know they are not the same thing and each has different steps. Great article and thanks for sharing. Thanks for the tips on keeping your black interior clean; there were a lot of things I’d never thought of. I had no idea that you could use ordinary window cleaner to clean spots on your carpet. In my opinion, I would leave the detailing to the professionals because they have the tools needed and the know-how. Ah detailing, such a tough job. I clean my black interior of our vehicle so much, I feel like I can recite these all off by heart. Yes I agree, some things pros are better at, however, I do like to spend time doing my own vehicle as much as I can. It also curbs the cost, unless of course it is something I don’t know how to do, but that is what YouTube is for right? Many car owners confuse polishing with waxing. But they’re separate steps. Polishing removes small surface imperfections and scratches and buffs the finish to a shine. I never knew that a window cleaner could remove stains from car carpets. I need to get my car cleaned this weekend. Thanks for the tips for keeping black interior cars clean. Way cool! Some extremely valid points! I appreciate you penning this post.Thanks for sharing this nice post! It’s not that hard to clean black interiors. White is the one who’s hard to maintain and also beige. Keeping the interior protected is difficult if you have a large dog. However, a decent car seat cover could really help you. 4Knines and BarksBar are two of the most popular car seat cover manufacturers around and produce the highest quality products. These wiill help keep your car interior protected for a long time. Wow, this post is so helpful! Should I use the leather protection liquid after each time of cleaning car? I think my inside leather is a little bit old. Great post! Definitely looks like a great cleaner to use on your vehicle. This is excellent advice! I appreciate your tips. Seriously thank you for all this awesomeness and thanks for sharing such a valuable post and Keep Posting! Nice job woman! I like ladies who knows how to DIY! I didn’t know window cleaner could remove coffee stains from a car’s carpet. I might have to try that since I’m on the go a lot. I heard that rhino linings can protect against spills as well. I’m using Armor all. It works just fine. Thanks for the article , i have a black interior and i am struggling to keep it clean. You cannot be comfortable in an uncleaned interior of a car. The interiors can be cleaned from all kinds of dirty things and be maintained effectively only by professionals. Use of seat cover is one of the best ways to maintain the interior aesthetics of your vehicle. If the upholstery is marked with ink stain, the use of hairspray could make a difference. For ordinary spots, you can get many kinds of solutions available in the market. To clean the carpet from stains, first it should be blotted and then, the use of glass cleaner will produce the result. Yes, it is very common to everyone that no matter what they do with their cars, but their cars always end up with a mess. Because cars are usually come in contact with dust particles their use and I think black is that of color which makes the dust more prominent. Thus, obviously regular vacuuming and dusting is needed to keep the car interior clean. So, one should vacuum the interior carpet, seats, seat crevices, console on a regular basis to keep it clean. 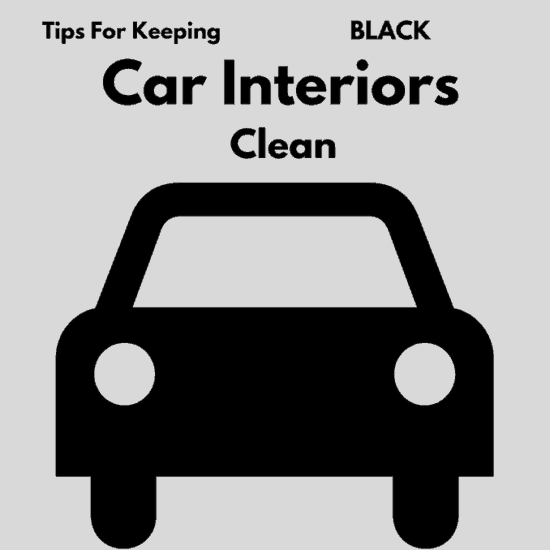 Apart from this, I would like to tell that the tips you have shared here will definitely help an individual to to keep his black car interior clean and dust free. Thus, on a final note I can say that there is no special science to car vacuuming but one needs a good vacuum with few attachments and has to spend few minutes to get the job done. Thank you so much for sharing such useful info. Thanks for the tips… I could use it on my car. I got a black and grey interior. I like the one with the coffee stains on the carpet. I didn’t know that. Ya, it is true that black is very difficult to manage. For ex: when birds poop on them, it becomes more eye catching as compared to that of white car. Similarly dusts and pollen affect the interior of car. So, those having black car should have to know the fact that have mentioned in the mentioned in the blog, which will help them in keeping the car interiors clean and dust free. Among all the points, I mostly liked the point that was described with the way to remove ink and fresh spot from the black seats. It is absolutely an unique concept for me. That is why I am appreciating your post and would like to say thank you fro sharing this. I am very happy to found this post, I have read something new to keep black car upholstery clean. These tips will help me to keep my black sedan neat and clean. Thanks for sharing these amazing tips with us. These are such useful tips and tricks! I had no idea that hairspray could remove ink, or that Club Soda could take out spots. I’ll definitely have to reference this in the future for my mom’s black upholstery. Thanks for sharing! This is a very useful post. My wife just got a car with a black seat her love for monochrome though the black is complemented with sliver lining very sleeky interior. This will go a long way for maintenance. Thanks for the post. Thanks to the author for sharing this article about to keep an We must keep our car neat and clean so that it will need less maintenance and cost repair. Mostly car battery and engine need maintenance and repair. We must keep take care of our car and always keep it clean and tidy so that it will need less repair. I am having a BMW car sine 12 years . It is running good and smooth. If any damages occur I use to give it to the BMW Repair in Ojai for repairing. My fiance and I just bought a new car. We really want to take good care of it, however, we have a yellow lab that we like to take places. So, I like that you talked about how it would be good to get seat covers to keep his fur off of the seats. Keeping a car clean is difficult especially with black interior. I have a dog so I always find hair on my seats or dashboard. The black interior just makes the brown dog hair stick out more. Thanks for sharing these tips. Black car interior has a bad rep when it comes to cleaning (especially when the dogs get in the car). These sure are some great tips. Thank you for sharing! I’ve always wanted black interior but I know it will be a pet hair magnet. These are great tips! Let us know when you find a miracle anti-dust product! Good tip about using hairspray for ink. I rarely get my pets tangled with my interiors so ‘m okay with that part. I could share this one to a friend! I like the way my car smells after I’ve cleaned it. The hardest part to clean is the seats in the back because they’re covered in dog hair and spilled food and drinks. Some really fantastic tips, thank you! With 4 kids is always a struggle to keep the car clean! Wow these are great tips, thank you for sharing. i have to share them with my husband. i love all the tips! we have a car that is all black your tips are awesome and would be sharing this to my husband for future use! Great tips! I had ones ink on the front seat. Now, I know what to do. I am not good with cars which is why I like having products that I can rely on when it comes to car maintenance. These are awesome tips, thanks so much! Simple to remember tips for black car owners. It will definitely help maintaining a clean and elegant look for a black car interior. These are wonderful tips! I will tell my husband about these tips for our car, he will surely find this post very helpful. Super handy tips! My car interiors are black and it’s really difficult to keep clean! I don’t think I have ever been in a black car with black interior. It is a sleek look though! These are great tips! We have black leather seats, but they are easy to wipe off. If they were fabric, with my kids, they would be stain riddled by now. I like the tip for cleaning the carpets, I am going to give it a go and let you know how it works. That club soda trick sounds good for my car. My seats can use cleaning. tara pittman recently posted..Aquagear Filter Pitcher Giveaway! $69.95 RV! Thank you for this info! I’m always trying to keep my car interiors clean but when you have a child it is not so easy.